We are just under one week away from the recently confirmed Apple media event, which will take place at the Yerba Buena Center for the Arts in San Francisco at 10AM PST on Wednesday March 7th. During the event we will finally get to see just what Tim Cook and the rest of the Apple engineers have been secretly producing for us. It is pretty much nailed on that we will see the announcement of the next-generation iPad which will bring to an end the twelve month spot in the limelight that the fantastic iPad 2 has been enjoying since March 2011. With the help of the creative team over at iCarbons.com in Titusville, Florida, Redmond Pie would like to celebrate the life of Apple’s second generation tablet. For those that love to apply accessories to their gadgets and have yet to discover the iCarbons.com company, you really have no idea what you are missing out on. The company is fast gaining a reputation around the online iCommunity for not only manufacturing and stocking a wide range of premium skins, but also excelling where it matters the most – providing first class customer service. I have said it before, and will continue to say it time over, customer experience is what separates the good companies from the great ones. iCarbons stock a wide range of skins which are manufactured out of 8mm thick, 3M Carbon Fiber Vinyl, offering amazing scratch protection and a life span of up to 12 years. The beautiful look and feel of carbon fiber has been captured by the company and recreated on to vinyl skins which are available for a multitude of popular consumer gadgets including the new PS Vita, the Xbox 360 and most Apple mobile devices. In normal circumstances, the fact that the product and customer service is of such a high quality is normally enough, but in this instance things are taken a little bit further. iCarbons also offer their 3M vinyl skins in a range of colors to suit differing tastes and devices and every now and then you will even see a new or limited edition skin appearing, such as the beautiful Steve Jobs tribute vinyl for the iPhone and iPhone 4S. There seems to be an increasing trend for skin companies to also offer a downloadable set of wallpapers for devices such as the iPhone and iPod touch which compliments the purchased skin and iCarbons are no different with a number of free downloads available from the site. Mobile phones (iPhone 4S, 4, 3GS, 3G, Droid RAZR, Galaxy S II, HTC Evo 3D, Moto Atrix, Samsung Infuse, Droid X, Droid Incredible, Droid 2, Nexus One, Samsung Epic, HTC Evo 4G, HTC Inspire). Tablets (iPad, iPad 2, Kindle Fire, Galaxy Tab). MP3 players (iPod nano, iPod touch). Computers (Mac Mini, MacBook Pro, iMac, MacBook Air). Games consoles (PlayStation 3, Xbox 360, PS Vita, PSP GO, Nintendo Wii, Nintendo 3DS. TV devices (Apple TV 2). Accessories (Apple TV remote, Mophie Juice Pack, iPad 2 Smart Cover, Airport Extreme, Lifeproof Case). As you can see, the list of what you can enhance aesthetically using an iCarbon vinyl skin is pretty extensive and more are being added all of the time. They even have an accessory for accessories with the ability to skin Apple TV remotes and even the Smart Covers. Prices start at $9.95 depending on which skin you require and rise accordingly, but considering these products have a shelf life of up to 12 years for indoor use the price pales into insignificance. Because we have an Apple media event coming up, we are going to celebrate in true Apple fashion by dropping the ‘wait, there’s one more thing’ bomb shell. 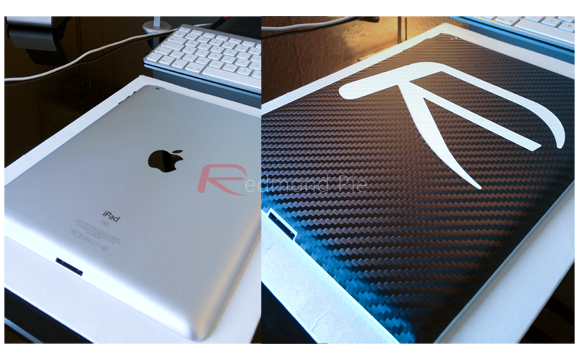 The guys over at iCarbons have not only been good enough to donate us a couple of iCarbons skins to giveaway, but have also created custom Redmond Pie skins to celebrate the life of the iPad 2. With the third generation iPad looking likely to be announced in less than a week, now is your time to get your hands on a limited edition Redmond Pie iCarbons vinyl skin, which will never be manufactured again. We have two of these skins to give away, one black carbon with the white styled ‘R’ and one in white carbon with a black styled ‘R’. Make sure to follow our three pages on Twitter, Facebook and Google+. Click here to share this story with your followers on Twitter. Comment on the Facebook post about this story here, we will then choose two winners at random to receive these limited edition skins. You can be of any age to enter and yes its open for everyone around the world. Last date of entry is Monday, March 5, 2012 at 11:59 PM PST (Pacific Standard Time). Winner from all the valid entries will be drawn and be notified by email on Tuesday, 6th March 2012. Head on over to the official iCarbons website to view their product range and check out the Twitter account for regular giveaways and promotions, but remember that these Redmond Pie branded skins are purely for the purpose of this giveaway and not available to buy from iCarbons. UPDATE: Congrats to Naji Abe & Jared Ambrose! 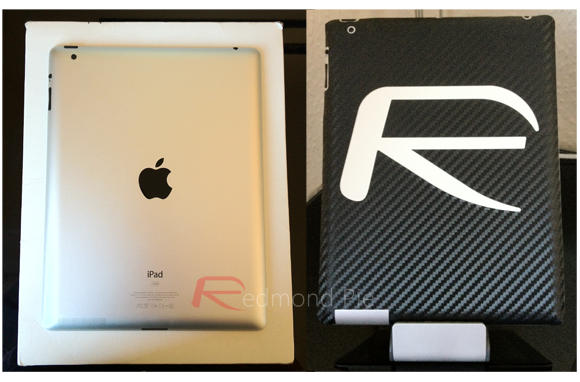 You’re both lucky winners of iCarbons’ Redmond Pie Vinyl Skin For iPad 2 giveaway!